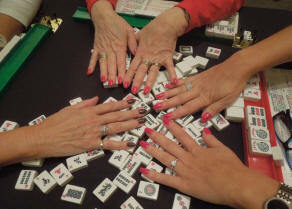 A MAH JONGG ADVENTURE IN LAS VEGAS! Our friends over at Mah Jongg Madness have a major tournament coming up. If any of you are interested in going to a 4-day fun-filled Mah Jongg adventure in Las Vegas then this is the place for you! JOIN US FOR THE EXCITING 3RD ANNUAL MAH JONGG TRADESHOW WITH VENDORS! 4 Days and 3 Nights in this Incredible and Exciting City….and you are right in the MIDDLE of the Strip! All tournaments qualify for 2+ MAH JONGG MASTER POINTS as A DRAGON POINT EVENT. This entry was posted in Uncategorized and tagged harrah's, Las Vegas, mah jongg, tournament, vendors on January 18, 2014 by Mah Jongg and Me.